Bed bugs a problem? Than the solution is Thermal Remediation. 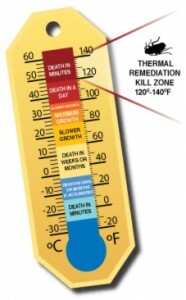 Thermal remediation is when the temperature in the affected area is brought up to levels that are lethal to bed bugs. All bed bugs die instantly at 122 degrees, eggs, larvae, and adults. In order to assure that every crack and crevice reaches lethal temperature, the heaters generate 135 degrees Fahrenheit and the temperature is held for a minimum of an hour. Chances are if you have bed bugs, you brought them into your home while traveling. If you having the feeling you’re not alone in bed at night let the professionals at Eco-tech help. Good information to know, an adult bed bug is about 5.5 mm long, and will take repeated blood meals over several weeks. The adult females lay’s up to 5 eggs per day continuously during its life. This means that one female bed bug can lay between 200 and 500 eggs during their lifetime. So if you’re saying to yourself well I haven’t been bitten so I must not have bug beds right. Wrong, even knowing that bed bugs live off blood an adult bug can actually live 10 or more months WITHOUT a blood meal. With equipment designed specifically for the application of heat to kill bed bugs, our highly effective process relies on three main keys to a successful treatment heat, monitor, and moving of air. Electric bed bug heaters are placed within the space, and bring the room temperature up to but not exceeding 135 degrees. Temperatures are monitored in real time to ensure lethal temperatures are reached without damaging objects in the home. Fans which are designed for the heat move heated air throughout the space to reach insects in cracks and hiding places or in the nest zones. If you are looking for an environmentally friendly, nontoxic bed bug control solution with total elimination of all stages of bed bugs, including their eggs, then choose a Thermal Heat Remediation Treatment! This non-chemical, non-toxic approach penetrates wall cavities, mattresses and other hard to reach locations to kill bed bugs. Let the experts at Eco-tech handle all your Bed Bugs problems just call to schedule an appointment (612) 237-8282 • (651) 633 8600 • (952) 881-6662 • (763) 785-1414. 24/7 Emergency Service! Call (612) 237-8282 or (763) 732-7296 for an immediate response to your pest or animal problems.